Just after midnight on August 31, 1997, Princess Di was in a fatal car accident with Dodi Fayed in Paris. They were being chased by seven French paparazzi into a tunnel under the Seine River. The chauffeur of Dodi’s car hit a concrete pylon that spun the car against the tunnel wall. Dodi died at the scene along with the driver. Princess Di along with her bodyguard were taken to the hospital. She suffered injuries of shock, cardiac arrest and a severed pulmonary vein that the doctors couldn’t overcome. The world is currently morning her shocking death and the passing away of a beautiful woman that was thoughtful, kind and sincere in her celebrity. The time of the accident of 0:35 does not indicate how fatal this time would be for Di. It doesn’t have the signature profile of a sudden death chart that an astrologer could predict death. That feature is probably in the driver’s chart. 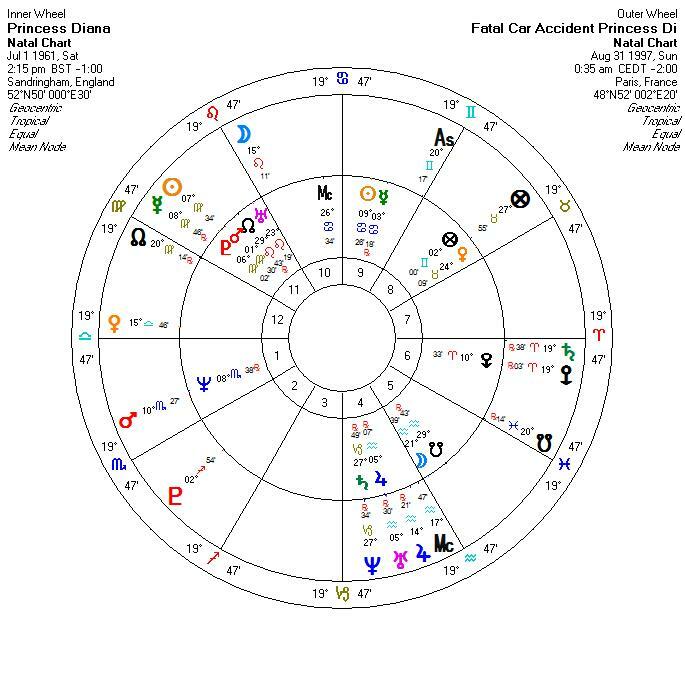 Everyone in the car was under the control of the driver; therefore his chart would be the dominant one to look at for the accident. This will probably never by published so it will be hard to verify. What can be said about the timing of the accident puts a 20° Gemini Ascendant on Princess Di’s 7th house of third parties, (i.e. the driver or Dodi Fayed) and Saturn is there on the cusp. The ascendant of the accident was square the transiting Lunar Nodes and on Diana’s equal 10th cusp. This represented major changes in her public live and image. She was being hounded by the press. This was being shown with Dodi Fayed being openly declared her serious suitor to the public. Note that the Ascendant of the accident square the nodes can mean implusivity and the unexpected. However, she could get these moments fours times in a day during this period, which doesn’t make it predictable but being in a solar eclipse period up the chances of shocking events. Transiting Sun conjunct Mercury was on her natal Pluto and they were squar transiting Pluto. Mercury is associated with short trips so this transit could point to a car accident that could be fatal. 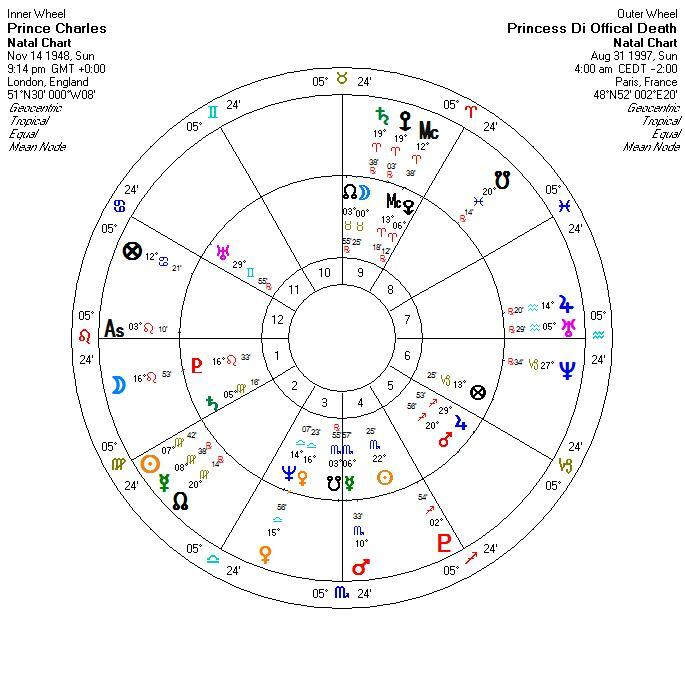 This ties in the male element here with the Sun representing men in her chart and it was conjunct transiting Mercury which I associate males. There were three men in the car. The last really interesting transit for this event was that Venus was opposing transiting Saturn. This could indicate the old man that was the driver. The opposition brings in the element of surprise but it could just as well mean the termination of old relationships (Charles) or both. The transits of Mercury and Venus are frequent and would not point to death but the transiting lunar nodes during an eclipse period could. Despite the tragedy of her death, this event has tremendous impact on Prince Charles’ chart. The announcement of her death at 4:00 am Paris time is very insightful. Three degrees Leo on the ascendant of the death announcement fell directly on Charles’ ascendant of 5° Leo. 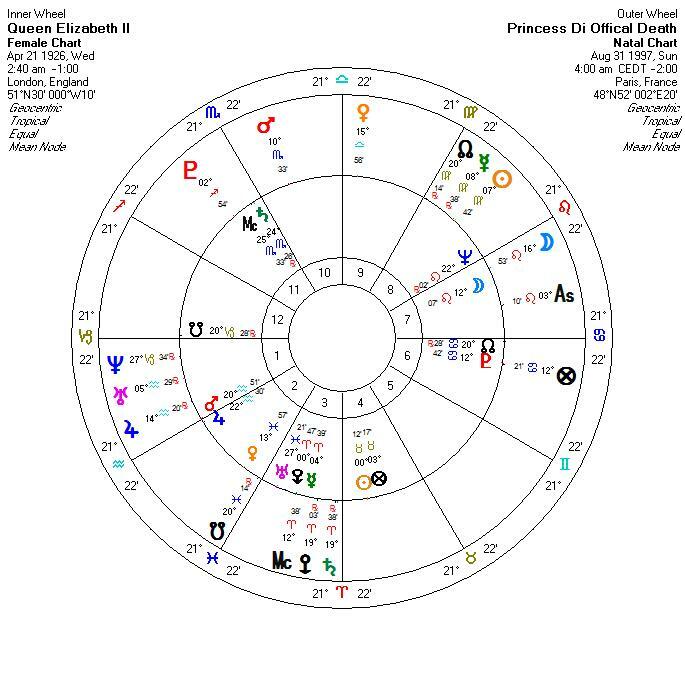 The announcement of Diana’s death to the Queen’s chart is favorable too. The Queen’s Sun and Part of Fortune fall on the event’s equal house 10th cusp. This is the house of public opinion and career. Her Sun can represent her, Charles or Prince William and Harry because it is elevated in a position of prominence. Transiting Moon opposition Jupiter is on the Queens’ Moon and her Mars. This brings positive changes to her family and her public image. However the public demanded that she publically attend and mourn Prince Di’s death. 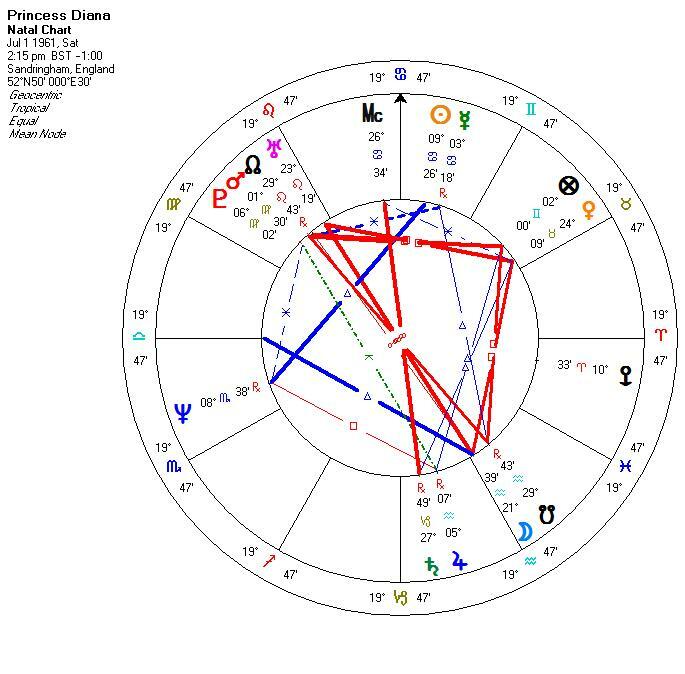 Transiting Pluto has been on her MC for several years as the monarchy has gone through much public airing of unseemly private matters in the media. Her public persona was in being critized for ignoring the public sentiment. Prime Minister Blair got the Royal Family down to London to remedy their images. 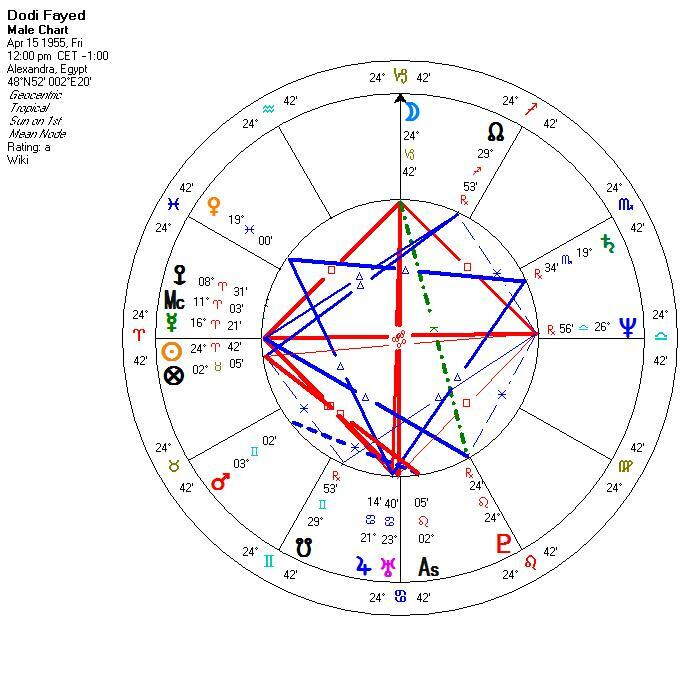 Transiting Sun square this Pluto transit on her MC puts her and her son in the public eye. This may very well be the last major blow to the Royal family’s image for awhile. Princess Di died one day away from a partial solar eclipse. Her entire funeral is forcing the monarchy into the public eye with great emotionality by the world’s love of this woman. In death as in life, Diana had managed to shake the British throne down to its foundations. This entire eclipse period of August 30-September 16th forced the monarchy to change all established rules to save the future generation of Kings (Sun square Pluto and the eclipse) for its place in royal secession. On another note, Diana’s brother had predicted that the press would be the death of her. Seven paparazzi at the scene were arrested that night since they were chasing Dobi’s car. Afterwards, the media discussed the terrible cost of celebrity by chasing for pictures in the tabloid press. There could be major laws enacted in Britain after this event and in many other countries. With Pluto (planet of dramatic transformation) in Sagittarius (ruler of publishing) the event could be the catalyst for social reform of the printed media. Princess Diana born 7-1-61, 7:45 PM, Sandringham, England. Di’s Fatal Accident on 8-31-97, 12:10 am, Paris, France. Diana’s Death Announcement on 8-31-97, 4:00 am, Paris, France. Prince Charles born on Nov 14, 1948, 9:14 pm, London, England. Queen Elizabeth II born on 4-21-1926, 2:40 am, London, England. Sources are from CNN on 8-31-97 and Solar Fire database of charts. Addendum to article dated 9-14-97 and 1 June 2017. As more information has become available in the press, the fatal accident time has been moved from between 0:27 am to 0:35 am. This new time places the Ascendant of the accident between 18-20 degrees Gemini. This only tightens the timing to be more exact on Di’s ascendant of 18 Sagittarius. It puts the transiting lunar nodes exactly on the equal house 10th of prominence and public opinion. Dodi Fayad’s birthdate is April 15 1955 in Alexandria, Egypt. No time in available. The accident had transiting Saturn between his Mercury and Sun in Aries. This was a time of stabilization in his work and personal life. He wanted roots and order. Transiting Pluto was opposed to his Mars. This is a time of obsessive desire to achieve his goals and needs. It creates a tremendous need to achieve. Transiting Neptune had been on his Moon and was still in aspect. A time to be in love with ideals especially regarding women and money. It could be deception with money too and he was noted for not paying his bills to creditors. The transiting lunar nodes were on his Venus, a time of great change with whom one associates with in friends and lovers. The nodes were prominent in his chart along with Di’s. They could have been more strongly placed if I knew the time of day of his birth. It was a powerful time for him, but death was not in a strong astrological signature in his chart.